Battir, Occupied West Bank – “O green Battir, mother of the air,” Mariam Ma’mmar sings in praise of her village. As the hot season draws to a close, the land – her people’s strength – dries up. But not here in Battir, where a peaceful form of resistance against the Israeli occupation is taking root. The 5,000 people of Battir pride themselves on their cultural and historical relation to the landscape. Ensconced in 554 sq km of dry stone walls, the largest network in the whole of Palestine of terraced fields, orchards and vegetable gardens cascade down into a deep, steep-sided valley. Battir is the exception to Israel’s rule in the West Bank – the only Palestinian village where the Green Line doesn’t exist. Owing to the Roman cistern and aqueduct, water flows all day long, flooding and feeding the agricultural terraces. Eight natural springs shared among Battir’s eight families fill the ancient irrigation system, nurturing dreams of self-sustenance, brimming with life, for everything that reaffirms their connection to the land grows in Battir. Long gone are the days when the reputation of its aubergine, the betinjan battiri, spread beyond Battir’s confines. It’s a pitched battle now. 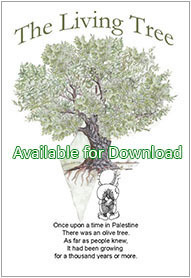 On one slope, the invader presenting a united front of stiff pines planted around Israeli settlements; on the other, in scattered ranks, the gnarled olives, symbol of the Palestinian attachment to the land. Pine needles acidify the soil and endanger the nourishing olives, notes Ma’mmar. The Har Gilo and Beitar Illit settlements grow behind the pines. A third one, Givat Ya’el, is developing. The standard eight-metre-tall wall of concrete slabs slowly crawls towards Battir, impounding large tracts of Palestinian land on its way. Initiated in 2002 at the height of the second Palestinian Intifadah uprising to protect Israelis, the security barrier of walls and fences encroaches on most of the territory that Palestinians envision as part of their future state. Israel’s Defence Ministry has been trying to erect the wall in the valley since 2006. “There’s no reason to build the wall. No Israeli was injured or killed here,” says Battir Mayor Akram Badr. The villagers petitioned the Supreme Court in Israel to divert the barrier and prevent the confiscation of land and destruction of the rich environment and its irrigation system. 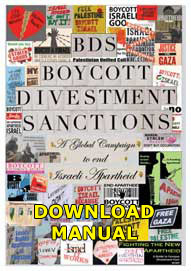 They gained improbable support from the Israel Nature and Parks Authority, a governmental body. In May, the court interceded on the villagers’ behalf. It suggested that the Defence Ministry propose “non-physical” alternatives to the wall. A court decision is pending for December, but alternatives are already in place. Surveillance cameras and sensors are posted on hilltops. Patrol roads crisscross the area. Security vehicles monitor the safe passage of the daily dozen trains. “We’re optimistic,” says Mustafa ‘Aweinah, a Battiri farmer. The newfound confidence conjures up the lay of the land in terms of its historical precedent. The fields stretch beyond the Ottoman-era railway that meanders between Jerusalem and Tel Aviv-Jaffa. The tracks overlap the 1949 demarcation line, the famed “Green Line” drawn in the Armistice Agreement signed in Rhodes that ended the first Arab-Israeli war. The train hasn’t stopped here since then. At the time, Hassan Mustafa, a Battiri journalist who’d graduated from the American University in Cairo, managed by ways of persuasion and relations to extract from Israel an extraordinary concession in the annals of the conflict. In exchange for their commitment to protect the railway, the farmers retained the right to cultivate their land across the tracks, inside Israel proper. When Israel captured the West Bank in 1967, the Green Line ceased to prevail. The international community insists it be recognised by Israel as the basis for future borders in the current negotiations with the Palestinian Authority towards a two-state solution. In all, 30 percent of the village land straddles the Green Line and lies inside Israel. Every other part of Battir falls under either full Israeli control (Area C), or mixed Palestinian administrative/Israeli security control (Area B). In stark contrast with other planned segments of the barrier where weekly battles pit Palestinian demonstrators against Israeli soldiers, in Battir farmers cultivate a peaceful form of resistance. “By promoting ecotourism, the Battiris protect themselves. They compel Israel to guarantee their land,” explains Battir landscape eco-museum director Michel Nasser. 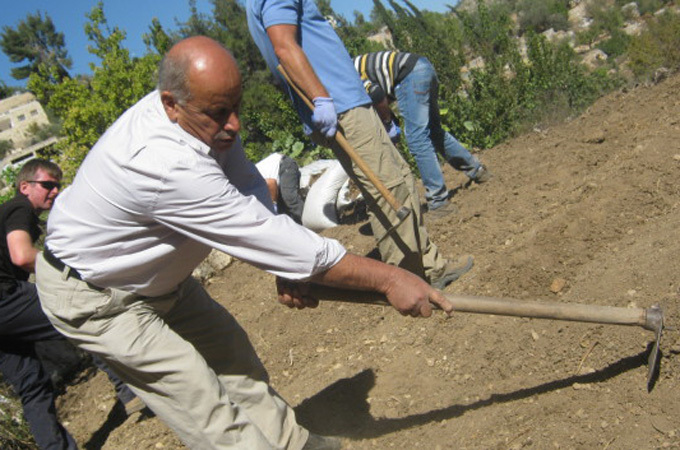 Armed with spades and pitchforks, a delegation of the British Consulate in Jerusalem helps ‘Aweinah plough his plot and plant broad beans. No stones hurled here. Instead, there are hiking trails designed to explore the area’s pristine beauty; a guest house is due to open this month; and the eco-museum was inaugurated in February. Thousands of tourists visit Battir over the year. “A green, environmental, Intifadah,” smiles Badr. Awaiting the court ruling, the villagers sought to have Battir listed as a World Heritage site recognised by the United Nations Educational, Scientific and Cultural Organisation (Unesco), which approved Palestine full membership two years ago. They hoped the nomination would be granted as an emergency measure to convince Israel to reroute the barrier. 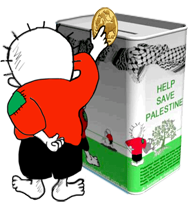 But in June, the Palestinian Authority renounced pressing ahead with the endeavour, to respect its commitment to refrain from unilateral moves during the nine months allocated to the peace talks.